- Hans-Georg Gadamer. “Hermeneutics as Practical Philosophy.” In The Transformation of Philosophy: Hermeneutics, Rhetoric, Narrative: 333-334. I recently came across an episode of Ancient Aliens on the History Channel that spent an enigmatic hour describing the ruins of Puma Punku in the highlands of Bolivia. The precise angles with which the giant granite boulders at Puma Punku were sliced into slabs is nothing short of incredible. Any way you look at it, Puma Punku is a great feat of engineering. How could an ancient primitive civilization have accomplished this? In spite of myself, this episode had me fascinated. I think what was most captivating about it was one part their profound creativity speculating about the evidence and one part the passion that so obviously drove these “ancient astronaut theorists.” These guys were just loving this stuff. They were in their element; this is what they live for. My first reaction was, of course, to laugh at how ridiculous these guys were with their implausible beliefs (and with their wild hair). But the more I reflected on it afterward, the more sympathetic I became, not because they’ve won me over to ancient astronaut theory but because of the daring way they’ve chosen their beliefs. These self-proclaimed “ancient astronaut theorists” seem to choose their particular hermeneutic approach based on its explanatory scope and on an aesthetic taste-based evaluation of the results of its application. In other words, they interpret the evidence as saying that aliens interfered with ancient human history because (1) it so easily explains much that we don’t understand about ancient history, and (2) it’s just really awesome. And strangely enough, I think I have now developed a soft spot in my heart for ancient alien theorists, and in a weird way I envy the strength of their convictions. While this seems like an extreme case, I’m not sure it really is. I think that everyone forms their beliefs roughly in this way, religious or otherwise. It’s hard to deny that our beliefs serve a practical purpose in our emotional and social lives, giving us hope or explanation or passion or meaning. 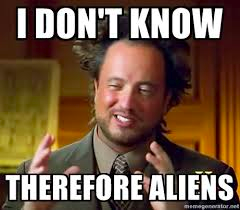 What makes the “ancient astronaut theorists” so absurd? I think it is simply that they choose their beliefs more explicitly and more directly in opposition to popular opinion than most of us do. To speculate, maybe their beliefs about aliens serves a purpose in the way their lives are infused with meaning. In that way, I’m not too different, except for maybe in the specifics. I think that when we talk of presuppositional beliefs, religious or otherwise, it is important to explore why we hold our beliefs, or as Gadamer says, to uncover the “motivating meanings.” Sometimes it’s just superficial to talk about the actual content that we can articulate and ignore our motivations that drive our attachment to it. If we’re interested in doing honest hermeneutics with fellow hermeneuts, we need to turn the microscope on ourselves. Hermeneutics, the task of interpreting of the world in which we find ourselves already entrenched, is always one of self-discovery. Why do I believe what I believe? What motivates me to hold these beliefs? It’s a bottomless project, Gadamer reminds us, but a fruitful one (“Hermeneutics as Practical Philosophy,” 334). What I think is so remarkable about these particular ancient astronaut theorists is that, against all opposition, they have decided to interpret the world in this way. And I suspect they are able to articulate and defend exactly what most of us wish we could uncover about ourselves. They’ve played their cards and put down their chips, while the rest of us sit and wonder what mysteries our hands hold. But at our core, I think we’re all ancient astronaut theorists with our implausible beliefs (and sometimes even wild hair), and I think that’s really okay. Our interactions with our friends and with strangers on the street often make us play cards we didn’t know we held. Our beliefs are secured in place by support structures that we can’t see, sustained by reasons we can’t articulate. So hermeneutics is archaeology. The more we interpret, the more we reinterpret and discover ourselves. And who knows; maybe in the ruins of Puma Punku, we’ll find a granite monolith inscribed with our deepest reasons. When we’re doing formal philosophy or having a casual conversation, there is so easily a tendency to talk past each other. Our ideas are, it seems to me, often built on intuitive hunches, and we are sometimes convinced of them long before we are able to articulate why. If Gadamer is right, and self-discovery is an endless task, is it possible actually to meet someone in conversation, or will we always pass them by in one way or another? Does a common language or vocabulary secure a shared medium between two conversation partners, or is it just impossible to come to complete grammatical agreement about meanings and reasons? How do we and how should we encounter others in the task of hermeneutics? Matthew E. Johnson is a current junior member at the Institute for Christian Studies, serving as the research assistant for the Centre for Philosophy, Religion, and Social Ethics. The motto of the "Man Will Never Fly Society" is "birds fly, men drink". There are degrees to which one is conscious of the deliberate character of belief-holding. The profession of certain beliefs for the sake of fellowship alone seems counterintuitive to those of us raised on the idea that only propositional chains rooted in true assertions will suffice, but after awhile doesn't the latter actually seem more absurd than the former in a way? Thank you for opening up the field of hermenautics, Matt. I think you're right about the "degrees to which one is conscious" of what beliefs we hold. Even when we think we are consciously building our beliefs on the evidence, we bring with us all kinds of motivating presuppositions. And on the other end, though we might be able to prove the legitimacy of our beliefs using evidence, it's still just superficial; it never really gets to the bottom of why we hold them. It's difficult to say with rational certainty that any of our "propositional chains" are grounded in what's "really out there." If we ask "why" enough times, we'll eventually hit the end of our ability to provide evidence. Does this mean that we have to admit that the best we can do is find certainty in what appeals most to us, for reasons of fellowship and solidarity with others or aesthetic appeal or for some other reason? What would that do to truth? Is there a way to go this route without falling into radical relativism? How do we honestly engage in hermeneutics without losing all the meaning that grounds us? Well, really, isn't the question past tense? Isn't it "what has that done to truth" and "we've fallen into radical relativism so what do we do now"? Maybe my pun wasn't so off-base after all. "Hermenautics" might imply an approach more suited to an environment where foundations are always provisional. I think of the reports from Chris Hadfield. When he floated about inside that space station he could still consider the walls firm, and push off from them or stop against them despite the lack of gravity. He didn't need to think of them as less firm and do mental calculations about how the inertia of his body was always transferred to the spacecraft, moving it slightly with every contact. He could trust the walls to behave as-if they were anchored firmly in an absolute frame of reference when in fact they, and he, were hurtling around the planet at an incredible speed, and in fact the planet itself was hurtling around the sun on a tether of gravity. from what I have see its not only the technology that was used by our pre history ancestors that has them convinced its also the writings the sand script writings, these writings or maybe better yet the knowledge of these writings is what inspired some of the old testament the story of the garden of Eden, the flood, angles coming to earth, Gilgamesh these stories are the 1st know writings and if you believe in these stories then don't you have to believe in all of them or are you cherry picking what ancient stories you will say are true, look to the ancient sand script for the origins of your old testament.